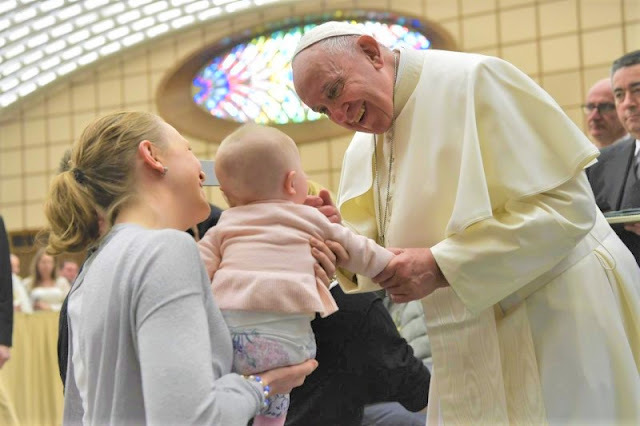 Catholic News World : Pope Francis to Pro-Life Academy "...the work of promotion and defense of life is always more effective and fruitful." Pope Francis to Pro-Life Academy "...the work of promotion and defense of life is always more effective and fruitful." I cordially greet you on the occasion of your General Assembly, and I thank Archbishop Paglia for his kind words. This meeting takes place in the first Jubilee of the Academy for Life: 25 years after its birth. On this important anniversary, I sent the President last month a letter titled Humana communitas. What moved me to write this message is, first of all, the wish to thank all the Presidents who have taken the lead of the Academy and all the Members for the competent service and the generous commitment to protect and promote human life in these 25 years of activity. We know the difficulties in which our world struggles. The fabric of family and social relations seems to wear down more and more and there is a tendency to close on oneself and on one's own individual interests, with serious consequences on the "great and decisive question of the unity of the human family and its future" (Lett. Humana communitas, 2). A dramatic paradox is thus outlined: just when humanity possesses the scientific and technical capacities to achieve a fairly widespread well-being, according to God's delivery, we observe instead an exacerbation of conflicts and an increase in inequality. The enlightenment myth of progress declines and the accumulation of the potentialities that science and technology have provided us do not always get the desired results. In fact, on the one hand, technological development has allowed us to solve problems that were insurmountable until a few years ago, and we are grateful to the researchers who have achieved these results; on the other hand, difficulties and threats, sometimes more insidious than the previous ones, have emerged. The "being able to do" risks obscuring the person doing and the person doing it. The technocratic system based on the criterion of efficiency does not respond to the most profound questions that man poses; and if on the one hand it is not possible to do without its resources, on the other it imposes its logic on those who use them. Yet the technique is characteristic of the human being. It should not be understood as a force that is alien to and hostile to it, but as a product of its ingenuity through which it provides for the needs of living for oneself and for others. It is therefore a specifically human mode of inhabiting the world. However, today's evolution of technical capacity produces a dangerous enchantment: instead of delivering the tools that improve their care to human life, there is the risk of giving life to the logic of the devices that decide its value. This overturning is destined to produce nefarious outcomes: the machine is not limited to driving alone, but ends up guiding man. Human reason is thus reduced to an alienated rationality of effects, which can not be considered worthy of man. We see, unfortunately, the serious damage caused to the planet, our common home, from the indiscriminate use of technical means. This is why global bioethics is an important front on which to engage. It expresses awareness of the profound impact of environmental and social factors on health and life. This approach is very in tune with the integral ecology, described and promoted in the Encyclical Laudato si '. Moreover, in today's world, marked by a close interaction between different cultures, we need to bring our specific contribution of believers to the search for universally shared operational criteria, which are common points of reference for the choices of those who have the serious responsibility for decisions take on a national and international level. This also means engaging in dialogue regarding human rights, clearly highlighting their corresponding duties. In fact they constitute the ground for the common search for a universal ethic, on which we find many questions that tradition has dealt with by drawing on the patrimony of natural law. The Lettera Humana communitas explicitly recalls the theme of "emerging and converging technologies". The possibility to intervene on living matter to orders of ever smaller size, to process ever larger volumes of information, to monitor - and manipulate - the cerebral processes of cognitive and deliberative activity, has enormous implications: it touches the very threshold of specificity biological and spiritual difference of the human. In this sense, I affirmed that "the difference in human life is an absolute good" (n.4). It is important to reiterate: "Artificial intelligence, robotics and other technological innovations must be used to contribute to the service of humanity and to the protection of our common home rather than to the exact opposite, as unfortunately they predict some estimates" ( Message to the World Economic Forum in Davos, 12 January 2018). The inherent dignity of every human being must be firmly placed at the center of our reflection and action. In this regard, it should be noted that the designation of "artificial intelligence", although certainly effective, may risk being misleading. The terms conceal the fact that - in spite of the useful fulfillment of servile tasks (it is the original meaning of the term "robot"), functional automatisms remain qualitatively distant from the human prerogatives of knowledge and action. And therefore they can become socially dangerous. Moreover, the risk of man being technologized, rather than the humanized technique, is already real: so-called "intelligent machines" are hastily attributed capacities that are properly human. We need to understand better what the intelligence, the conscience, the emotionality, the affective intentionality and the autonomy of moral action mean in this context. In fact, artificial devices that simulate human capabilities are devoid of human quality. It must be taken into account to guide the regulation of their use, and the research itself, towards a constructive and equitable interaction between human beings and the latest versions of machines. In fact, they spread in our world and radically transform the scenario of our existence. If we can also put these references to bear in mind, the extraordinary potential of the new discoveries can radiate their benefits on every person and on the whole of humanity. The ongoing debate among the same specialists already shows the serious problems of governability of algorithms that process huge amounts of data. As well as serious ethical questions pose technologies for manipulation of genetic makeup and brain functions. In any case, the attempt to explain the whole of thought, of sensitivity, of human psychism on the basis of the functional sum of its physical and organic parts, does not account for the emergence of the phenomena of experience and consciousness. The human phenomenon exceeds the result of the calculable assembly of the individual elements. Also in this context, the axiom according to which the whole is superior to the parts takes on new depth and meaningfulness (see Exhortation of the Evangelii Gaudium, 234-237). Precisely in this line of the complexity of the synergy of psyche and techno, on the other hand, what we learn about brain activity provides new clues about the way of understanding the conscience (of self and of the world) and the human body itself: it is not it is possible to disregard the interweaving of multiple relationships for a deeper understanding of the integral human dimension. Of course, from the data of the empirical sciences we can not draw metaphysical deductions. We can, however, draw from them indications that instruct anthropological reflection, even in theology, as has always happened in its history. It would indeed be decidedly contrary to our more genuine tradition to set ourselves on an anachronistic conceptual apparatus, incapable of adequately intermingling with the transformations of the concept of nature and of artifice, conditioning and freedom, of means and ends, induced by the new culture of acting. , typical of the technological era. We are called to place ourselves on the path taken firmly by the Second Vatican Council, which calls for the renewal of theological disciplines and a critical reflection on the relationship between Christian faith and moral action (cf. Optatam Totius, 16). Our commitment - even intellectual and specialist - will be a point of honor for our participation in the ethical alliance in favor of human life. A project that now, in a context in which increasingly sophisticated technological devices directly involve the human qualities of the body and the psyche, it becomes urgent to share with all men and women engaged in scientific research and care work. It is a difficult task, certainly, given the fast pace of innovation. The example of the teachers of the believing intelligence, who entered with wisdom and audacity in the processes of their contemporaneity, in view of an understanding of the patrimony of the faith worthy of a reason worthy of man, must encourage and sustain us. I wish you to continue the study and research, because the work of promotion and defense of life is always more effective and fruitful. May the Virgin Mother assist you and accompany you my blessing. And please, do not forget to pray for me. Thank you.